It's Sunday and I don't have a focused topic like yesterday. 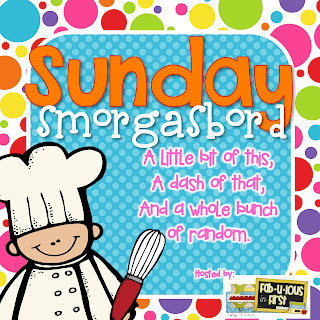 So, today I'm linking up with Fab-u-lous in First for the Sunday Smorgashbord! I thought I'd share a little bit of school thoughts along with some pictures from my recent vacation! Let's start with school....I'm usually not so eager to get back into my classroom but the fact that I can't get in until August 1st or later, makes me want in there MORE! Someone needs to remind me of this statement come mid-August! I keep gathering all these school supplies or thinking about a cool new bulletin board and feel "stuck" at home. Currently, I'm working on creating a "Meet The Teacher" bulletin board for the start of the year. I have a half bulletin board that's hard to see because it's partly behind a cabinet - and I needed to fill it with something! So, I purchased this student of the week set from United Art & Education and I'm currently printing pictures and getting photographs to complete my version. I also found this cute poster I want to hang up from Pinterest. 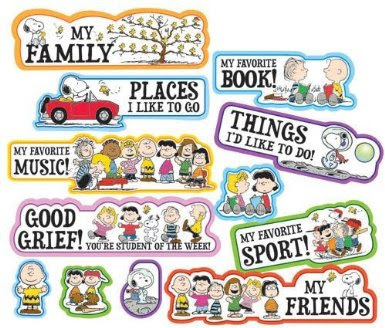 I thought it would go perfectly in my writing center area for next year.... Click the image to pin it your boards! A Night at the W... So I saw this online the other day. A night at Walgreens - did anyone else hear about this? You get discounts (yay!) and get to try some sample products! I love make-up... I think I have a lipstick/gloss addiction. You can search for your closest location on Walgreen's Night at the W webpage. I'm excited that my local Walgreen's is participating and it's FREE! Vacation (non-school related).... 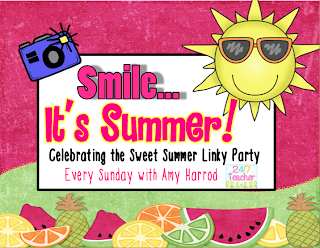 I'm linking up with 24/7 Teacher for her Smile...It's Summer! Linky Party! We also went the Louisville Zoo since it's a reciprocal zoo to Cincinnati. We were able to get discount admission so we figured it'd be fun... They have one of the "longest" train rides in the country according to the conductor. It is quite a long ride and it goes behind the scenes at the zoo. I also learned from the zoo that camels sleep lying down. I always thought they knelt down to sleep... I was wrong! I guess I need to study up on camels! After our day at the zoo, we decided to follow Adam Richmond's advice (Man vs. Food) and try Comfy Cow ice cream. Now, if you ever been to Cincinnati - it's not Graeter's. I mean Graeter's is Oprah and Rosie's favorite ice creams... Cincinnati knows it's stuff. But the sundae was as promised HUGE... Four scoops of ice cream, chess pie pieces, whip cream, and a cherry. We tried their Southern (Derby Pie ice cream), Salted Carmel, Butter Pecan, and Bourbon Ball. I can now say I've had Bourbon ice cream - not a common flavor in Ohio. On that note, I hope everyone is enjoying their summer! Don't forget to check out the Night at the W! Just enter your zip code to find a participating Walgreen's near you! Amanda, I want to get into my classroom too but I have a whole different reason why I can't...I lost my key! Yikes! I'm in trouble! I love the tiny tubs!!!! It looks like you had a great trip and I'd have to say the ice cream would have the hilight for me! Great post! the night at the w sounds like fun ... I love make-up and beauty samples :) OHHHH and that ice cream... just looking at it made me gain 3 pounds. I really like that pen holder thing! My kids put everything the wrong place. Lol! Thanks for sharing! I love your pics. of the great finds and ideas. I am your newest follower. I found your blog through another. I can't wait to read more post. If you get a chance I would love for you to come on over and check out my blog. Loveeee the tiny tubs! What a cool vacation too! Thanks so much for linking up! Your pictures from vacation are all fabulous but my favorite is the ice cream. :). Yum! I've heard from so many people how great the Louville Slugger place is. The kids are always coming back to school with mini bats. I always thought the same thing about camels...but I've got a feeling that we thought that from watching lots of movies. Did you know Joey Votto is my boyfriend. He doesn't know it either, but he is. Love Louisville!! Thanks for linking up! Just fond your blog and I am SO excited about it! I am moving from 2nd to teach 5th ELA and SS this year. I too am on a shoe string budget. Sounds like we have a lot in common :) I am your newest follower via Bloglovin'! Come stop by if you get a chance!